Nathan performed on Show 322 in Davis, CA, on March 18, 2016. 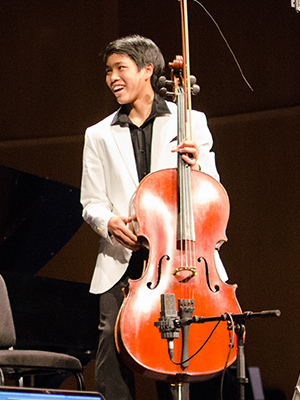 Nathan Le (cello), 16, is from Porter Ranch, California, and is a student at Sierra Canyon School. He studies cello with Ronald Leonard at The Colburn School. He won third prize at the eighth International Tchaikovsky Competition for Young Musicians, has been a finalist at the Mondavi National Young Artists’ Competition, and won first place at the Music Teachers’ Association of California VOCE Competition. Outside of music Nathan loves to play golf, ping-pong, flying remote-control helicopters, and reading books. Also, he is very interested in science, and has presented his project at the California State Science Fair.